Jane Addams was one of the most prominent women of the Progressive Era as a pioneer settlement worker and founder of Hull House, public philosopher, author, and head honcho in the women’s suffrage movement and advocate for world peace. The legacy that Jane Addams left behind can be found on UIC’s campus at The Jane Addams Hull House Museum where the museum itself has been making progress of its own. 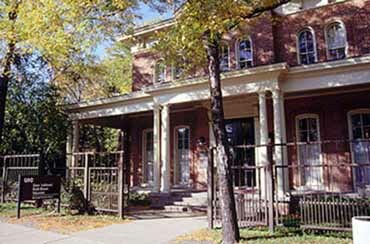 Recently, The Jane Addams Hull House Museum has made incredible renovations. The first floor has a great new layout that has a fantastic flow. There is a new exhibit where one can walk into a room as small as a alcove and be surrounded by the sounds that Jane Addams would have heard in her day. Stopping to take a moment to absorb the sounds of typewriters, newsboys, vendor carts and horse-drawn carts is highly recommended. For the first time since the museum opened its doors, the second floor is now open with fantastic and inspiring exhibits. One of the first rooms at the top of the stairs is Addams’s own bedroom. This room has vibrant wallpaper and relics that were so dear to Addams. Upon her old desk a visitor can pick up and read letters that Addams had written and received. The Nobel Peace Prize that Jane Addams was awarded is dazzling in a glass case right next to a three-inch thick FBI file that was all about Addams as she was seen one of the most dangerously powerful and educated woman of her time. Down the hall Addams’s bedroom is a room called the “Unfinished Business Room”. This room is probably the most interactive of all the rooms at The Jane Addams Hull House Museum. In the “Unfinished Business Room” contains an “expongement” chalk board where visitors are encourages to write something that they did wrong as a child and erase it, giving themselves a second chance as Addams gave many people. In the “Unfinished Business Room” is an exhibit titled, “Until I am Free” which is a collection of poems written by prisoners who were jailed as youth, tried as adults and sentenced to life without parole. Visitors to this exhibit are encouraged to write poems back to the prisoners. Along the walls of this extraordinary room is a rotating art exhibit, currently showing works by illustrator Josh Peter about juvenile social justice.